The big event in August was, of course, the 2016 Rio Olympics. As millions watched sporting legends like Usain Bolt, Michael Phelps make history, those behind the scenes were bringing all of us the stellar Olympics coverage by an army of cameramen, photographers, and yes, robots. Getty Images, the official photo agency of the International Olympic Committee, used Mark Roberts Motion Control’s robotic rig, which allows photographers to change a camera’s vantage point and move a full 360 degrees – all via remote control – bringing us closer to the action. The Washington Post utilised AI software, Heliograph, to cover the Rio Games – writing some of the ‘simpler’ news, such as: who won which event, which country is now first on the medal board. Having the AI conduct point-by-point updates freed up their human reporter counterparts to cover in-depth and more exciting stories. Pretty cool, right? Looking ahead to the Tokyo Olympics in 2020, we can expect to see robots take on even more roles, from greeting you at the airport, checking you into your hotel and showing you to your seat in the stadium. But first, we have the Rio Paralympics to look forward to, followed by the first ever Cybathlon this October in Zurich, Switzerland. While the use of technology by athletes in the Paralympics can be a contentious matter (due to issues of accessibility and affordability of such technologies for athletes from some countries), the Cybathlon will be celebrating the many ways in which robots can assist disabled people. Dubbed the ‘Cyborg Olympics’ by some, the event will include an exoskeleton obstacle course and a virtual race using a brain control interface. The difference robots can make to the lives of people with disabilities is astounding – enabling people to regain lost functions by lending a helping hand, or providing more independence. Exoskeletons, in particular, are at the forefront of such assistive technologies, with a number of products going through FDA approval at the moment. In the US this month, Dakota Privette, who suffers from cerebral palsy, got to experience his first ever steps with one such product, made by Rex Bionics. And he won’t be the only one to benefit once exoskeletons become available to patients. We also covered this topic in our Robots Podcast, with Hugh Herr, Director of the Biomechatronics Group at MIT. But exoskeletons are not the only robots used in healthcare – Intuitive Surgical’s machines (like the da Vinci) are increasingly used in hospital theatres around the world to make surgery safer and minimally invasive. And now, competitors are beginning to produce similar devices. Lastly, AI could eventually help doctors diagnose patients, but only if patients and doctors are willing to accept this technology, as argued by Owen Johnson from the University of Leeds. How human should they be? This topic of acceptance of – and trust in – robots can also be a concern for those creating humanoid robots for home environments. Researchers at the Istituto Italiano di Tecnologia have developed R1, a cheaper and more accessible version of iCub. The question of how ‘human’ robot companions should or shouldn’t be is an important one in this context. How much intelligence is too much? How much personality is too much? In addition, ever improving AI technologies could enable us to build robots that are more cooperative and more considerate, what we would consider as more human. But whether we are ready to accept such robots and trust them remains to be seen. Lots of big, big changes in autonomous vehicles happened over the month. Top roboticist Chris Urmson quit Google’s self-driving car division, making him the latest in a string of high-profile resignations that could become a problem for the autonomous car division of the company and could cost them their status as a leader in the field. Meanwhile, others working on autonomous cars are making preparations to get their vehicles out onto the roads. In Singapore, Delphi Automotive is testing on-demand self-driving taxis, while in the US, cab service Uber’s autonomous cars are arriving in Pittsburgh. Not to be outdone, Ford has promised it’ll have fleets of driverless cars out on the roads by 2021 and Airbus has announced plans to build helicopter-like autonomous flying taxis to tackle city traffic. Truly, the autonomous vehicle competition has been dynamic to watch. We can only wait and see what will happen in the next few years. Others benefitting from the race to get autonomous vehicles out onto the roads include companies Velodyne and Quanergy, both of which received funding this month to improve their LiDAR technologies – an essential component for most assistive steering and self-driving tech. Meanwhile, at MIT, a team has managed to pack their LiDAR sensor onto a single chip smaller than a dime, which could eventually be mass-produced at low cost. For a summary of what’s been happening in robocars, Brad Templeton’s Robocar Recap is a great once-stop-shop. Crowdfunding can be a good way to make things happen in robotics – but it doesn’t always work. With lots of stories of crowdfunding success, it’s easy to forget that less than half of projects on Kickstarter (for example) manage to reach their funding goal. And even among those that hit their target, not all actually manage to deliver on their promise. For instance, Jibo, originally crowdfunded in 2014, announced it won’t be able to ship the social robot to any investors outside of the US and Canada. While affected investors will receive a full refund, the disappointment and anger at the group’s failure to deliver Jibo became clear in Twitter responses following the announcement. So while crowdfunding can be a fantastic investment, there’s no guarantee of success. Robohub’s roundtable discussion focused on problems with crowdfunding, unrealistic expectations, improbable timeframes, and what to look out for. But it’s not all doom and gloom because when crowdfunding works it’s a wonderful way to get a project off the ground. FarmBot.io just finished its Genesis launch with more than eight times of its fundraising goal and they clearly have investors excited at the prospect of having an open-source farming machine in the not too distant future. In the world of big business – and big money – there’s rarely a month without at least a few announcements about new investments and acquisitions. Recently (to name a few! 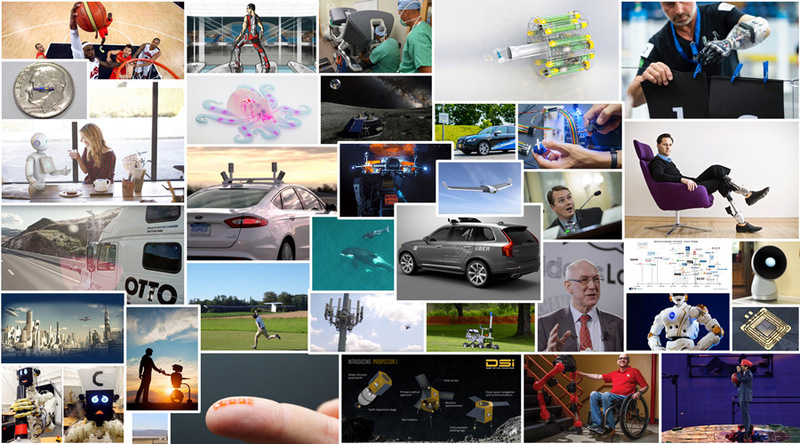 ), German robot maker Kuka was bought by China’s Midea; Google acquired French company Moodstocks; Cambridge Medical Robotics raised $20 million in Series A funding; FiveAI got $2.7 million in equity funding; and Autonomous Marine Systems secured $1.6 million in seed funding plus $1.9 million in matched funding. For a summary of this summer’s big funding, acquisitions, and failures be sure to check out Frank Tobe’s Robot Report. On the flip side, robots can also , in turn, be affected by the economy, as is evident in the field of underwater drones. These robots are typically used by fossil fuel companies to support exploration, drilling, construction and maintenance, but some have now been mothballed as a consequence of the slump in oil prices. Sticking with the topic of drones, the FAA’s new regulations, that finally clarifies how media companies are allowed to use drones, led to a bout of enthusiasm for the use of such technologies. CNN launched CNNAir, their new drone division which will be dedicated to aerial imagery and reporting. It’s not just media companies enthusiastic about drones – private users are excited that these technologies and new consumer drones are entering the market regularly. The next addition, due to be launched soon, is Parrot’s “Disco”, a fixed wing drone that can fly for up to 45 minutes and reaches top speeds of 70 kilometres per hour. In other drone news, researchers in Hawaii used drones to help them count whales from the air, without having to disturb the animals, and a team in Switzerland performed a 26-hour search-and-rescue flight with their AtlantikSolar UAV, which could ultimately help tackle the European refugee crisis. NASA is one of the key funders and supporters for space robotics and its sample return robot challenge has now reached the final stage. Seven teams will compete for the £1.36 million prize by showing off their robot’s ability to locate and collect samples in a three-day event to be held in September. We wish them luck and will let you know who won as soon as the announcement is made. And another NASA-sponsored competition, the Space Robotics Challenge has now kicked off! The challenge promises a potential $1 million award for teams to develop abilities of an R5 robot to contribute to NASA missions to Mars in future. There’ve been announcements from other space robotics companies, as well. California-based private space company Moon Express has been granted permission to land a robot on the moon – and is planning to do so as soon as next year. And Deep Space Industries announced that it plans to fly the first commercial interplanetary mining mission before the end of this decade. August saw a few reports on soft robotics, including news that a research team from Harvard University had demonstrated the first 3D-printed autonomous, untethered, entirely soft robot, and a team at the University of Warsaw designed a bioinspired caterpillar soft robot that is powered and controlled by light. And, non-profit company RISE (Robots in Service of the Environment) is creating an underwater robot that can hunt lionfish, which are invasive to the Atlantic ocean and are causing damage to coral reefs. Mechatronics 2016: September 5-8, Loughborough, UK. COSUR 2016 – 1st bi-annual summer school on control of surgical robots: September 5-9, University of Verona, Italy. Robobusiness: September 28-29, San Jose, California.